If it all sounds a bit heavy for “Alice in Wonderland,” that’s because it is, and if it sounds a bit familiar, that’s because it almost exactly mirrors the plot of “Prince Caspian.” That’s the biggest problem with Burton’s take on the “Alice” story; it is completely lacking in whimsy and, yes, wonder. By taking the film in an epic fantasy direction, not unlike that of “The Chronicles of Narnia,” Burton all but obliterates the peculiar humor of Lewis Carroll’s gloriously witty prose. “Alice in Wonderland” has always been a dark tale, but it was never a particularly serious one. This new film takes itself way too seriously, and its humor seems far too calculated, lacking the spontaneous absurdity at which Carroll was so adept. You do realize that it is the book Through the Looking Glass, and not just a new random take on the original book, right? Tim Burton did make a new squeal to it, they made the already written second book. This is not "Through the Looking Glass" or they would have just called it that. 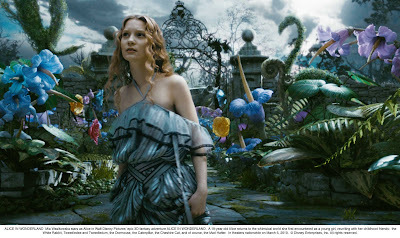 The credits state that it was inspired by "Alice in Wonderland" and "Through the Looking Glass," but that it is not a direct adaptation of either.